+“Expediters” That would be the extra person between the one who rolls your burrito and the one who rings up your order. Her job? Getting your drink, asking whether your order is for here or to go, and bagging your food. +“Linebackers” The people who patrol the countertops, serving-ware, and bins of food, so the ones who are actually serving customers never turn their backs on them. 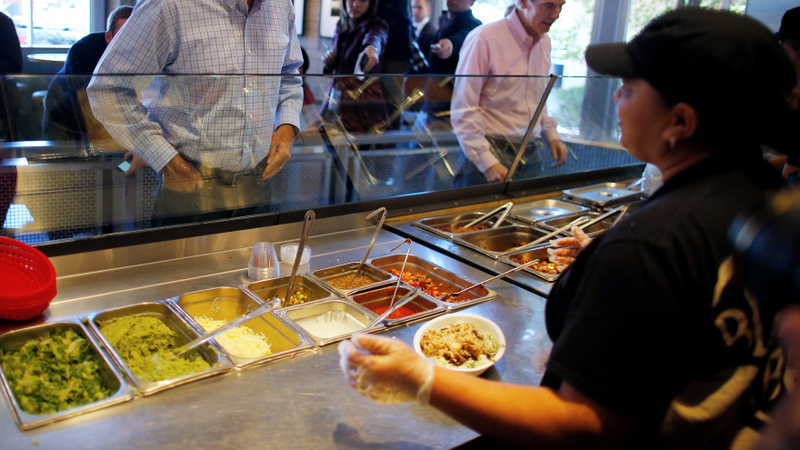 +“Mise en place” What in a regular restaurant means setting out ingredients and utensils ready for use means, in Chipotle’s case, zero tolerance for not having absolutely everything in place ahead of lunch and dinner rush hours. +“Aces in their places” A commitment to having what each branch considers its top servers in the most important positions at peak times, so there are no trainees working at burrito rush hour. Chipotle is also mulling incorporating a Starbucks-style mobile payment system (the chain already accepts online orders for pick-up), which the company is hopeful will help funnel customers in and out of its lines a bit faster. But the company is open to a number of other options, too, so long as they help speed up service.